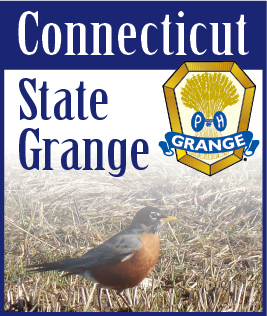 The 134th Annual Session of the Connecticut State Grange will be held Thursday through Saturday, October 18-20, at the Holiday Inn Norwich, 10 Laura Blvd., Norwich, Connecticut. Delegates from over 40 local Connecticut Granges will be present to take part in the Session, which includes discussion and action on over 20 different resolutions proposed by local Granges. The resolutions enacted at the Annual Session determine the legislative policies of the Connecticut State Grange for the coming year. Many awards will be presented throughout the Session to Granges and individuals, including membership, family activities, public relations and community service. The Session also plays host to many contests for both adults and juniors. Amanda Leigh Brozana-Rios, National Grange Communications and Development Director, is serving as the National Grange Representative to the Session. Brozana-Rios has taught communications and journalism, and American Studies, as a teaching assistant and then adjunct instructor at the University of Alabama. She also served on faculty at Stillman College, Tuscaloosa, Alabama, and Bridgewater State College (now Bridgewater State University) in Bridgewater, Massachusetts. During her time at the National Grange, she said she is most proud of launching the Communication Fellows program that has helped teach basic communication skills to members who prove to be part of our up-and-coming leadership core and the quarterly magazine, Good Day!. 2018 is a Connecticut State Grange election year. Outgoing Connecticut State Grange President Noel Miller will present his final address on Thursday evening, October 18, at 8:00 PM. Election of Officers will be held on Friday morning, October 19, at 9:15 AM, with installation of the new officers being held Saturday, October 20, in the late afternoon. On Saturday at 3:00 PM, the conferral of the Sixth Degree of Membership by the officers of the Connecticut State Grange will take place, featuring a Rose Drill presented by Grange members from across the state. The Celebration Banquet will be held Friday evening, featuring scholarship awards, professional agricultural awards, the 2018 Granger of the Year presentation, and a program prepared by Connecticut State Grange Lecturer Marge Bernhardt of Cheshire. The Connecticut State Grange has been an integral part of rural and non-rural communities across the state for over 130 years, with currently more than 40 local Grange chapters in Connecticut. Local Granges are committed to bettering their communities through service projects, legislative and agricultural initiatives, and family orientated activities. For more information on the 134th Annual Session of the Connecticut State Grange, or on Granges throughout Connecticut, please visit www.CTStateGrange.org.